赵玉超, 王仁杰, 沈敏, 董甜甜, 崔彦婷, 王淑生, 凌涛, 李玉全, 付瑞江. 2019. ZHAO Yu-Chao, WANG Ren-Jie, SHEN Min, DONG Tian-Tian, CUI Yan-Ting, WANG Shu-Sheng, LING Tao, LI Yu-Quan, FU Rui-Jiang. 2019. Oceanologia et Limnologia Sinica, 50(2): 347-354. ZHAO Yu-Chao, WANG Ren-Jie, SHEN Min, DONG Tian-Tian, CUI Yan-Ting, WANG Shu-Sheng, LING Tao, LI Yu-Quan, FU Rui-Jiang. 2019. EFFECTS OF TEMPERATURE AND HIGH SALINITY ON EGGS HATCHING, METAMORPHOSIS RATE AND SALINITY TOLERANCE OF LARVA IN LITOPENAEUS VANNAMEI[J]. Oceanologia et Limnologia Sinica, 50(2): 347-354. Abstract: Based on the fertilized eggs and larvaes of Litopenaeus vannamei, the effects of high salinity and temperature on hatching of fertilized eggs and larval development were discussed, the tolerance of larvae to salinity stress and the effect of high salinity stress on the metamorphosis of larvae were studied. High salinity stress and temperature had significant effects on hatchability, first hatching time of larvae and concentrated hatching time of larvae (P < 0.05). 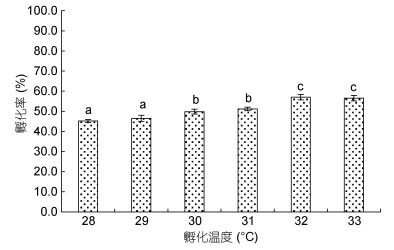 As the increase of salinity and temperature, the average hatchability performed increasing first, then decreasing, the hatchability can reach the maximum at salinity 30 and 32℃. The hatching rate dropped from 74.67% to 50.79% when the salinity rose from 33 to 36; the hatching rate was only 3.42% at salinity 39, no nauplius was hatched at salinity 42. The fertilized egg can finish hatching at 7.5 hours of embryo development; the initial hatching time of larvae would be prolonged by the increase of salinity at the same temperature. 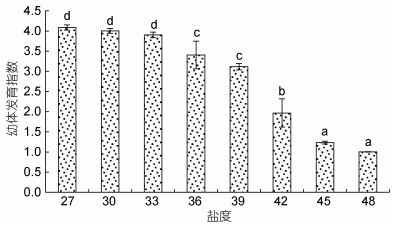 Under the range of salinity 27-33 and 30-33℃, the fertilized egg concentrated on the incubation process of the naupli by 7.5-11.5h after the embryonic development, it took the shortest time to fulfil brooding. The tolerance of the larvae to high salt stress was gradually improved with development by metamorphosis. There was no significant difference in salt tolerance between mysis stage larvas and P1-P3 stage post larvae (P>0.05). 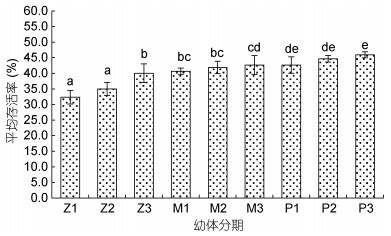 In addition, the larval stage index also decreased with the increase of salinity, the higher the salinity, the slower the development of larvae. 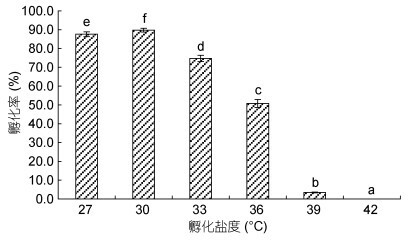 The results showed that high salinity and low temperature could inhibit hatching and metamorphosis of L. vannamei, and the upper limit of the salinity of the fertilized egg hatches was between 39 and 42.